The flood situation in north-west India is expected to ease in the next one/two days, before it finally starts getting better. The UAC, which was expected to fizzle out on Monday, has moved and is today located west of Delhi region is expected to move in a north-easterly direction, and weaken rapidly. The dates to watch out for in the Utteranchal/West U.P. region are between September 22 and 23, when rainfall will be heavy in that area. Delhi, Haryana, east Rajasthan, north Madhya Pradesh, west Uttar Pradesh can expect heavy to moderate spells during that time. Meanwhile, in H.P, rain continued to lash various parts of the state. Poanta received 74 mm, Renuka 70 mm, Nahan 50.2, Jubbal 46mm, Rohru 40 mm, Solan 37 mm and Manali 27 mm. The rain also led to a dip in the temperatures with Shimla recording 11.8°C, Kalpa 6.2°C and Keylong 6.6°C. In Haryana, at least half a dozen villages were cut off as fresh floods washed away stretches of roads and inundated large tracts of cultivated land in a dozen villages. Nabiabad, Sayeed Chapra, Japti Chapra, Nagli and Chandrao were cut off and the district administration had to provide boats to ferry the villagers to safety. Khukni near Chandrao had been marooned. Bhiwani, Haryana received the heaviest fall of 90 mms as on Tuesday. Delhi falling in middle of all this action was in the midst of inclement weather. The maximum temperature as on Sunday was pleasant at 23.3c (10c below normal). To the delight of Delhiites, it was only 0.2c warmer than the minimum recorded at 23.1. But the coolest in the Capital was at the University recording station, with the day's high at 21.3c ! Dehra Dun was at a day's maximum of 20.4c (10c below normal) on Sunday. 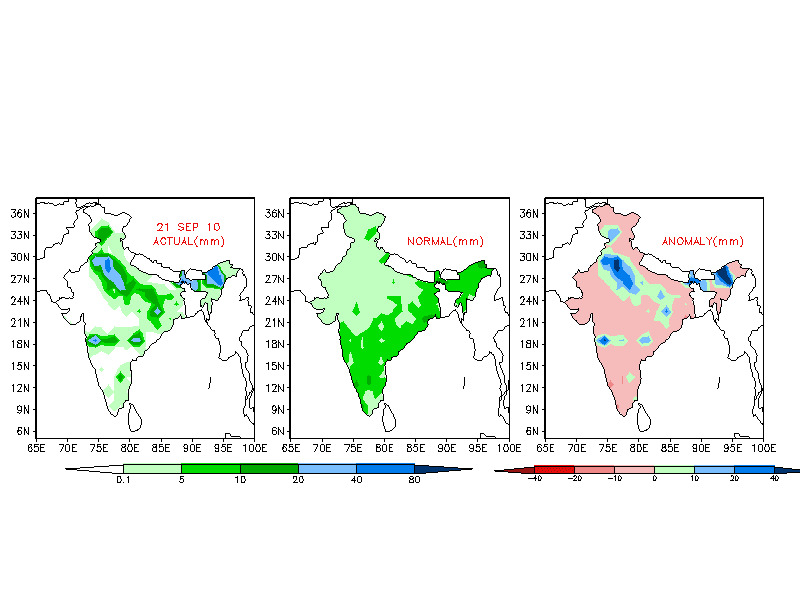 25, the monsoon seems to be withdrawing resulting in a drastic reduction of rainfall across India and northern India in particular.The forecasted COLA 850 hpa map shows the strong anticyclone (harbinger of post monsoon conditions) pushing the weakened UAC away to the east. The water levels in north India’s rivers should start receding from then onwards. According the Japanese Meteorological Agency (JMA), rainfall will also reduce in the two weeks after September 25. Vagaries could safely consider the monsoon widhrawal to commence from all Rajasthan, Delhi, Punjab and Utteranchal regions from the 24th.Will be confirmed on 24th.September. Later this week, Rajasthan and Gujarat may witness a rise in day temperatures . In the West, on Monday,Turbat and Nawabshah in Pakistan have climbed to 41c and 40c respectively. The highest in Asia though was Makkah at 44c. It may still be a week, after the monsoon widhraws, before we see a fall in night temperatures in Rajasthan, Punjab and Haryana. whatever abnormal the monsoon may be, my observation is that it more-or-less synchronises with the Hindu calendar. I mean with your Mumbai withdrawal prediction, the withdrawal again tallies with start of Navaratri roughly. You may recall mostly we have light showers during the Dandia every year. The new look of 'Vagaries' is really nice. The different tabs for different weather related discussions looks neat and organized. Keep the good work going!! As per NGP forecast a 'low' is likely to develop somewhere around coastal Karnataka and then travel in the SE direction before dissipating around Chennai. Will this low help to pull NE winds and therefore begin the process of onset of the NE Monsoon? Or is it too soon for that? emkay, you are right. I always keep in mind the Hindu calendar,and tally my estimates. Since the last 30 years, for the onset as well as widhrawal, I tally and match the forecast, ground situation and Hindu calendar to make an estimate. nt, Thanks for your kind words of encouragement. And yo too keep your views posted on the blog to help us. I personally do not see this kind of a low developing in the west coast, and tracking SE is very difficult to imagine. In fact, I see a low in the Bay around the 25th, and shall put that up in the vagaries next time.